When we go to a drug store to buy a hair product, we usually end up with more cosmetics. Hair balm, mask, heat protection spray, serum for hair ends, shine-boosting lotion… the list can be longer. We often ignore the list of ingredients or don’t have time to read it. As a consequence, our hair is presented with an array of parabens, silicones, dehydrating short-chain alcohols. Instead of repair – total hair destruction. Wouldn’t it be amazing if you could replace numerous hair products with one exclusive cosmetic that would be also free from parabens, silicones and comedogenic substances? The product that would regenerate hair and scalp as well as beautify and protect your hairdo after the very first application? Nanoil has managed to live up to women’s expectations and created a versatile, excellent product that outclasses all nourishing, repairing and even styling products. It is Nanoil hair oil. Nanoil is a product of finest quality. It makes an amazing first impression: enchanting, fancy, intriguing design (black glass bottle with a mahogany wooden cork). Power of carefully selected natural oils is captured inside the bottle. You’ll spot the uniqueness of Nanoil at once. The cosmetic comes in three different versions. Each one suits different hair type; each version includes different, properly selected natural oils – the ones that will really work for your hair. The most important criterion that decides about your hair condition is hair porosity. There are three types of porosity: low, medium and high. The higher the porosity, the more damaged the hair that needs intensified repair and protection. 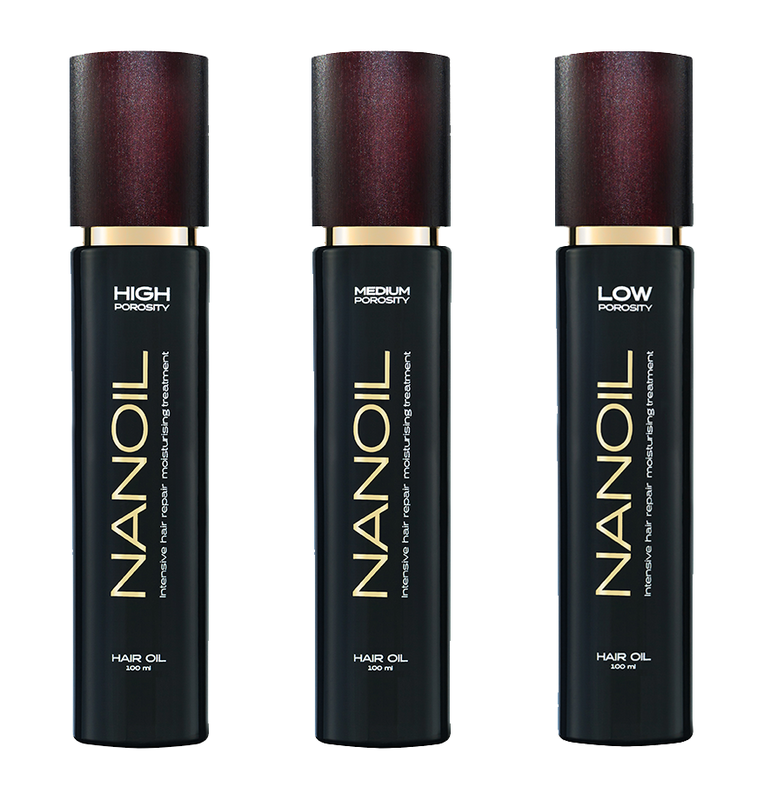 Nanoil hair oil has been created in 3 versions. Each version works for different porosity, or different hair type. Hair porosity has a direct influence on the proper choice of hair care for your hair. If you’ve ever had a cosmetic that weighed your hair down or caused frizz, you must be aware that the cosmetic must have been unsuitable for your hair type. Such a situation won’t happen again if you reach out for Nanoil hair oil. One of the 3 variations will surely work for you. Let it amaze you with its properties. Nanoil hair oil – presentation of team that rebuilds hair. Now, take a closer look at your hair and think how it behaves while washing or styling. Try to link it to one of the following descriptions. 1. … thick, strong, stiff, it resists styling. It is hard to add volume to such hair. Heavy and thick, often flat. It slowly dries and absorbs water. It is often affected by dandruff and excessive sebum secretion. 2. … medium thickness and volume, often gets dull and frizzy. It starts falling out, which results in thinning. Hair ends get damaged. Hair needs special attention. Bulbs are weak whereas hair stem gets destroyed and requires fixing. 3. … damaged, dehydrated, brittle, stiff, has lost its shine and vitality long time ago. Weak and thin hair. It absorbs water as quickly as loses it, therefore it is hard to moisturise this hair type. It gets frizzy and static. Hair ends get damaged and brittle. ♥ If number 1 describes your hair best, choose Nanoil for low porosity hair. This version of Nanoil hair oil contains numerous natural oils that work for low porosity hair care. As a result, your hair will be no longer flat and overburdened. Nanoil hair oil will protect your hair from damage and deliver softness and volume by gently lifting the roots. All you need to do is regularly oil the scalp – to boost volume, keep the scalp clean and prevent excessive sebum secretion. The oil will make your hairdo luminous and shield from high temperature. ♥ If number 2 describes your hair best, choose Nanoil for medium porosity hair. Nanoil for medium porosity hair offers a set of natural oils made of medium-sized particles – ideal for your hair type. Not only will it protect the strands from roots to tips but also reinforce hair bulbs and stop hair loss. Nanoil for medium porosity hair will rebuild damage on hair surface. What is more, it will shield from damage, toxins and heat. Your hairdo will be beautiful, luminous and bouncy. ♥ If number 3 describes your hair best, choose Nanoil for high porosity hair. It allows to rebuild hair structure, provides proper level of moisture and instantly boosts shine and softness. Nanoil for high porosity hair will strengthen hair, repair from bulbs to ends, protect against further damage and shield from heat. Moreover, Nanoil hair oil conditions the scalp and brings back proper moisture. I have thick and heavy hair but terribly flat and no hairspray helps or any conditioner isn’t able to add lightness to the hairstyle. Did any of you have a similar hair problem and will this oil help ? ?